The D&D alignment system is perfect. Yes. That’s right ladies and gentlemen. The D&D alignment system is the best system out there, and it does its job perfectly. It applies to every type of sentient being, and every character, without exception. It has no flaws whatsoever. I haven’t been drinking. Now I know what you’re thinking. Well… no I don’t, but judging by the millions of alignment debates that are scattered throughout the interwebs (including a couple I’ve participated in), many people don’t agree with me. There are many complaints, but generally speaking, there are two. Of all of them, this argument makes the least sense to me, because it actually perfectly demonstrates the opposing viewpoint. It’s correct. Alignment is not the same as character. It’s not the same as personality. Counterargument: It’s not meant to be. Your strength score doesn’t tell you whether that strength is in your legs, arms or core. It doesn’t tell you how fit you are. It doesn’t give you your body type. It doesn’t tell you your BMI. It doesn’t tell you your childhood or at what age you stopped growing. It doesn’t tell you why you are as strong as you are. It doesn’t tell you which gym you go to. Strength, like alignment, is there to perform a function in the game. You have to come up with the rest on your own. Additionally, yes, everyone fits on the axis somewhere. Are you good or evil? If it genuinely doesn’t apply, you’re neutral. I know there’s more to your character, and yes, you can sometimes act outside of your alignment and still be in character (because character and alignment aren’t the same), but you didn’t hem and haw for a week about your 13 wisdom not fully representing your dreams, aspirations and life experience. I’ll never look at your alignment and know if you’re a cat person or a dog person. There have been attempts to fix it as a result of this complaint of “I’m more complex than that”. It’s fascinating stuff. The most interesting attempt at a fix is the expansions. Trying to add in another axis (making it 3x3x3). Turning it into 4×4, or 5×5 alignments instead of 3×3. Trying to force it to distinctly cover each personality type, and failing, rather than letting it be a general consolidation. This brings me to the next point. This one is the key I think. I’m not sure exactly why people don’t think it works, yet going through the vast majority of arguments on the topic, one thing seems clear. It doesn’t work. It doesn’t do what it is supposed to do. It doesn’t perform its function. That function is (according to them) building, and defining your character. And there’s the real problem. Counterargument: Its job is mechanical. Not creative. The alignment system is there, so that when the Cleric casts “Detect Evil”, or the Paladin uses his ability to “Smite Evil”, the DM can look at the thing on the sheet, and generalize, whether or not it works, without a Doctorate in Psychology, and a peer reviewed paper on the matter at hand. It can move. Like strength drain, or constitution loss, or getting more intelligence from a Wish spell. It’s not there to be a placeholder where your character’s personality should be. It’s not there to replace the need for motivation. It’s not there to replace morality. It is, like every stat, on every character sheet, in every system, a generalization of one element of your character used in game mechanics. It’s not very good at writing your character’s backstory for you. Defining your character. Building your character. It answers “yes/no/not applicable” to two questions. Are you good? Are you lawful? Overall, it leads to some convoluted arguments about what morality is, and there is a good argument to be made that in some D&D definitions of Good and Evil, they are not adequately represented as opposites. This is in part because D&D doesn’t go out of its way to define it. Leaving some leeway for DM discretion. 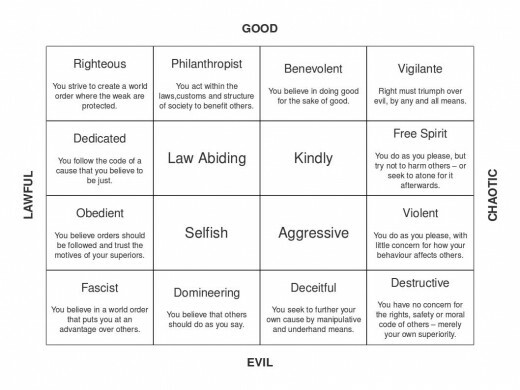 It simply lists some examples of things a good person might do, and things an evil person might do. It doesn’t overcomplicate. It does everything it needs to do to function in game, and honestly, doing more would actually start to intrude on character (No! You’re not a good character due to section C of definition 3!). I’m never, ever, going to use it to build my character’s backstory/mind/personality/morality. I’m not going to use it as a sole definition of my character’s actions any more than I allow my initiative score to. In every way it needs to be, and really, there’s only one way it does need to be, it’s perfect. Although, whenever I try to put my money in it, being a conceptual paradigm rather than strips of leather really holds it back. We’ll run Shadowrun; Because fighting a troll is no fun if it isn’t cybernetically enhanced. I had a great time at comicon, which you might expect, but if I’m honest, I was dreading it. All I could think of was “What if it all goes horribly wrong”. Not only was I risking disappointment just by showing up and it not being all I’d hoped for, but I was gonna be on stage too as part of my Improv Troupe, and worst of all, I had my own section I was running, and I was going to be running it alone. I was placed right next to the people playing Magic: The Gathering and WH40K, both with established fanbases in the UAE, and here I was trying to spark something new. Talking to the organizers there had already been a couple of miscommunications. My table had been given to some Kuwaiti guy. He had wanted to run D&D games and they thought we were the same people. But he hadn’t shown up according to the organizers… in fact, the table next to him was empty too. Two no-shows. Two free tables. “You can have them both if you want”. So I start to set up, I’ve brought as much as I could from the car, and ran back down to the for the second batch, I wave at Gimli as I pass him, he smiles, waves back, and says hello. I grab the rest of the stuff from the car. I realize what just happened. I’m not f—ing Gimli… I’m John Rhy… oh forget it. I run back, carrying my stuff, but he’s gone inside and I can’t see where. Ah, he’s a big celebrity, probably doesn’t want to be pestered by fans. So I go back to my booth and start setting up. A few friends make appearances. A couple of people with VIP passes are wandering through the stalls but mostly people are still fixing things. Hey! John Rhys-Davies is coming around saying hi to everyone! Then he came round to my stall, like he did everyone’s stall, to wish us luck and ask us what we’re doing. This guy, who has been in films nominated for 30 Oscars, and won 17, is going around showing genuine interest in what people are here doing. This in a town where many people with comparatively few accomplishments saunter around looking down on everyone else because they have an expensive handbag, or go to the best clubs. That set the tone for the rest of the con. The atmosphere was completely different from the elitist attitude of the big city. Nobody here was vying for status. Nobody had egos that needed to be massaged in order to get the slightest cooperation. Everyone was here just wanting to show people the things they loved doing. The organizer showed up flustered because the Kuwaiti guy showed up and was asking for his table. Me and the kid calling himself Q were allied within about 30 seconds. He could have access to all my stuff if he was running games, and I’d talk to people about gaming and explain what it was to the newcomers. He could have one of the tables… in fact he could have both if he needed them. No egos. No infighting. No alpha male bull I’m so used to in office politics, dealing with artists on the comedy circuit, or even family gatherings. If he wanted to take a break I’d deal with the games and he could look around the con. If I needed to take a break or look around the con, he’d take over. All over the con I found people just like me, who had been telling colleagues in stuffy offices what they do in their spare time and had been met with at best, feigned interest. Stall by stall, early on day 1. “So what’s do you do” was met with timid explanations, followed by bursts of enthusiasm as the exhibitors realize the people here, even if fantasy, or comics, or cosplay, or gaming was not their “thing”, weren’t asking out of polite small talk. The 2 days were a joy, I ran games, played games, talked to hundreds of like minded individuals, found some new comics I enjoy, several people who liked my booth brought food and water for me and the other people running games. Friends (old and new) came to help run and play games. It was exactly what I’d been looking for: A cynicism free zone, in the middle of Dubai. Hi everyone, and welcome to the Gulf Roleplaying Blog! Here I’ll be updating games I’m playing across the UAE, and inviting DMs to make posts about games they’re currently enjoying. The theory being that it’ll show people reading the variety of games that are going on in the UAE (but are currently hidden away). For example, did you know we’ve been running Dark Heresy and and AD&D games in Abu Dhabi? Did you know there’s a Call of Cthulu game, a shadowrun game, an upcoming custom game based on a dream someone had in Dubai? Wasn’t that game of Twilight 3000 (nothing to do with vampires) we just finished playing great? Did you know I’m developing my own roleplaying system and want to run some games to test it out? Of course not. Why would you? Nobody is talking about them unless they come up to me in the street because I’m wearing a D&D themed shirt and tell me personally. So there’s an easy solution: We all go out and buy roleplay based shirts and wander the streets hoping to run in to each other. Some have come up with crazy ideas that’ll never work. Things like a website slash forum thingymajiggy, a blog (You’re on it), a twitter and a facebook group. I say we do the shirt thing… but if you want to go trying out your new fangled computer things you go ahead. Hey, just FYI, I need everyone’s character sheet from my world of darkness campaign. Scan it, or email it, or hand it to me in person, or whatever, but I’d like to have a look see after some things have been brought to my attention. Ok, so we’ve gotten sloppy this week when it comes to organizing games. So, this Saturday, I’m busy. This Friday and Thursday, I’m not busy. Therefore, can we do a Friday game of (I assume) B5 this Friday at 4? Is Nancy coming? Is Li coming? Is Norm free? Is Bashar in the country? Does skip have her char sheet ready yet? (By the way, Norman, I don’t think she does have her char sheet anymore, so she says she probably wants a new character, leaving me as the only character left from the original game). I’ll send you an email on something else too. Last blog update we talked about balance in roleplaying games. Today, I’m going to talk about how to achieve balance in a roleplaying game. First of all, here comes a warning: A good portion of this is going to be math. A very good example of balance in my Opinion is the D&D critical system, and the “Improved Critical” feat. There are 5 types of weapon in D&D when it comes to crits. You can increase the multiplier (x2, x3, x4), or you can increase the threat range (20, 19-20, 18-20). Now these are not balanced with each other, they are supposed to be different after all, but lets look at how they react to having “Keen” applied to them. Now lets look at increasing the multiplier. As you can see, Keen does it’s job equally well irrespective of what style of critical improvement is caused, yet they do it differently. Do you want to do damage more often, or do you want to do bigger damage in single blows? Either way the total is exactly the same. The balance doesn’t go overboard and make all weapons the same. You still have a sliding scale of weapons, that have 2 styles, and that are impacted equivalently between the two. This in my opinion is the perfect feat when it comes to demonstrating balance within a game system. This is partially true. Each feat should be balanced against other feats to see if the feat shown here is worth more than some other feat. Of course it should. How should this be done though. Unfortunately, actuary tables for one thing. Statistical analysis. If I get +1 DC to my illusion spells, there is no damage I’m comparing it to. I’m basically saying “How much more often can I trick things”, and how do we measure that against extra damage from a weapon? The second way of doing it is simply going “which would I rather have?”, which skips a lot of the math. If you are having a hard time deciding which to pick, we might be able to consider it as “close enough” to balanced that it is acceptable, but don’t think for a second that means you’re necessarily correct. This poses a new problem however. You don’t create feats based on the math, you create feats based on a concept, and so you should. “I want to be able to backflip through a window”, not “I wish a statistically equivalent bonus to the character when near portcullises to offset the rarity of the event”. There’s no way however that I’m going to think of a feat that gives me enough of a bonus in any way that it’s going to compete with something as simple as Improved critical. One way around this is not using a feat system that occurs every few levels (like D&D) or one where all uneven Talents cost the same (Warhammer), but to value individual feats according to the usefulness. You want to jump out of a window? 25XP. You want to do double damage when you are on higher ground? 250 XP. You want to do triple? 500XP. This way our imaginations are not limited by the system, the system becomes a tool to enable our imaginations. You want to have the Great Cthulu as your mount? Why say no to it? Say 500’000’000’000 XP, and let the player earn it. Not so fast, I was getting to that. When the other players are running around with 499999999000 spent XP that the player is still saving up, he’s going to be in a world of trouble until that last point. So don’t make it a single feat. Let him build it. Ride a mount: 100 XP. Ride exotic mounts: 150 XP. Increase summonable monster’s level: 1000XP*level per level. Give monster tentacles: 100XP per tentacle. Increase Monster Size category: 1000XP*Size Category ^2. This lets him scale up his monster, and the things he can summon, slowly and on par with the other characters who can spend similar XP to do similar things. It doesn’t *have* to scale up to riding the great Cthulu, but there’s no reason to limit your system in that fashion. If you’re doling out 5 XP per session, the players won’t be planning to get to their target in 38.5 million years of sessions (assuming we play every other week). They’ll be taking those 20XP feats like “+1% chance to hit” or “+1% Intelligence”. The beauty of that is you have a system where the DM chooses the power level, not the system. “I want gritty realistic modern detective story!”. Done. “I want to play a Thor like character in a mythological story where we are the first gods!”. Done. Despite being drugged and kidnapped by members of the Cult of the Purple Hand they managed to escape and make a few new allies on the way. After spending some time at an archery tourney they decided to listen to the pleas of a small group of peasants from the nearby village of Delberz who were begging for help in dealing with Beastman raids. Compassion and the fact that Delberz is on the way to Middenheim anyway caused them to take up the cause. The adventurers soon found the Beastmen raids to anything but typical. A brief daylight incursion into the thick forest surrounding the village almost cost the life of one party member and that same evening the Beastmen displayed a level of tactical aptitude not usually seen in such fell creatures. This may be due in part to the Warrior of Chaos spotted by the adventurers directing the Beastmen attacks. Despite the odds the party prevailed the first night’s attacks with two seriously injured and a the villagers encouraged by their courage and valour in the face of dire odds. However as the dust settles and the sun rises certain questions are coming to mind…how and why is a Warrior of Chaos leading a group of Beastmen just four or five days ride from the regional capital and why haven’t the local authorities done anything meaningful to help the good people of Delberz till now? If I had to pick one thing that is most important when dealing with roleplaying games, it is this: Balance. Balance is everything. Balance is the reason for the system. Additionally, this should be inherent in the system, not something that you add later on. It is not OK because you can change the rules, just like my car is not OK without an engine just because I know how to build an engine. I’m not going to just shrug my shoulders when the dealer hands me an engine-less car. Every system suffers from this. D&D: Not all feats are equal. Able learner (everything is a class skill) is clearly superior to various feats which make 2 or 3 things a class skill. Menacing Demeanor (+4 intimidate) clearly superior to Skill Focus(Intimidate) (+3 to intimidate). Flee! gives you +1 movement, for D10 rounds, under special circumstances. Fleet footed gives you the same, for infinite rounds, any circumstances. They cost the same. They aren’t worth the same. Sure, fixes can be applied (Lets make it +D10 movement for 1 round. The total is the same, but the advantage is the headstart you get, which is exactly what flee should be). FaitNoctis on A Roleplaying Community? Baalthazaq on The D&D alignment system is perfect. QRS on The D&D alignment system is perfect.